CHICAGO (July 24, 2015) — The 81st annual Grant Park Music Festival continues July 29 with guest conductor Thomas Wilkins – music director of the Omaha Symphony and principal guest conductor of the Hollywood Bowl Orchestra – leading the Grant Park Orchestra. The program includes Jerry Goldsmith’s eight-minute Fireworks, Dvorák’s beautiful, large-scale “Symphony No. 6,” and “The Sunday Symphony” by William Grant Still, “the Dean of all Afro-American Composers.” Performance is Wednesday, July 29, 6:30pm in the Jay Pritzker Pavilion at Millennium Park. One hour before the concert, CSO’s Sounds and Stories contributor Laura Sauer hosts a free Club 615 pre-concert lecture with Mr. Wilkins on Wednesday, July 29, 5:30pm in Millennium Park’s Family Fun Tent located just west of the Jay Pritzker Pavilion. Wednesday night’s concert will also be broadcast live on 98.7WFMT, Chicago’s classical and fine arts radio station, and also online at wfmt.com/streaming. Open lunchtime rehearsals of for this concert take place Tuesday and Wednesday, July 28 and 29, 11 a.m.-1:30 p.m. Audiences are welcome to sit in the Pavilion Seating Bowl during rehearsals, and Festival docents will be on site to talk about the concert during rehearsal breaks. For more information about the Grant Park Music Festival including membership, one-night passes and group seating, visit gpmf.org or call 312-742-7647. For additional information, visit the Grant Park Music Festival Facebook page or follow the Festival on Twitter @gpmf. A complete Grant Park Music Festival schedule is accessible at www.gpmf.org. This concert is supported in part by John D. and Catherine T. MacArthur Foundation. The Walter E. Heller Foundation is a proud supporter of American Accents, Grant Park Music Festival’s ongoing initiative showcasing works by American composers, including Jerry Goldsmith and William Grant Still. 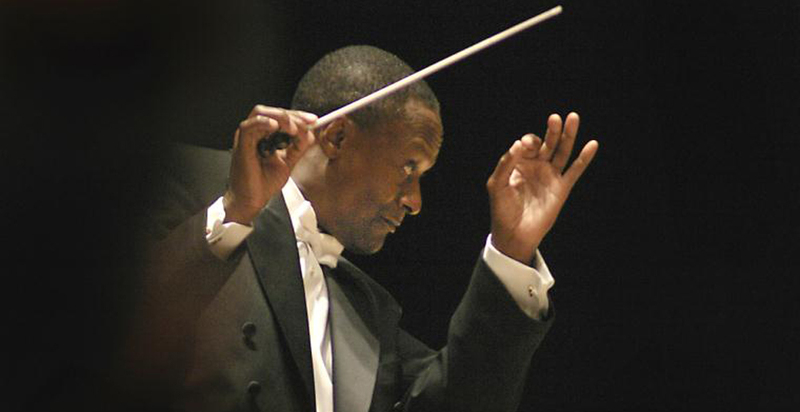 Thomas Wilkins is Music Director of the Omaha Symphony and Principal Conductor of the Hollywood Bowl Orchestra. He also holds the Germeshausen Family and Youth Concert Conductor Chair with the Boston Symphony. Mr. Wilkins’ past positions have included Resident Conductor of the Detroit Symphony and Florida Orchestra and Associate Conductor of the Richmond (VA) Symphony. He has also served on the faculties of North Park University in Chicago, University of Tennessee in Chattanooga, and Virginia Commonwealth University in Richmond. He has led major orchestras throughout the United States, including those of Cleveland, Atlanta, Rochester, Cincinnati, Columbus, Dallas, Houston, Buffalo, Baltimore, New Mexico, Utah and Washington, D.C., and continues to make frequent appearances with the Philadelphia Orchestra, Indianapolis Symphony, San Diego Symphony and New Jersey Symphony. Last season Mr. Wilkins returned to the National Symphony Orchestra for a two-week festival of American music and dance, as well as a collaboration with world renowned cellist Yo-Yo Ma at Wolf Trap, the NSO’s summer home. He has participated on several boards of directors, including the Greater Omaha Chamber of Commerce, Charles Drew Health Center (Omaha), Center Against Spouse Abuse in Tampa Bay, and Museum of Fine Arts and Academy Preparatory Center, both in St. Petersburg. Currently he serves as chairman of the board for the Raymond James Charitable Endowment Fund and as national ambassador for the non-profit World Pediatric Project headquartered in Richmond, which provides children throughout Central America and the Caribbean with critical surgical and diagnostic care. A native of Norfolk, Virginia, Thomas Wilkins is a graduate of the Shenandoah Conservatory and New England Conservatory. The Boston Globe named him among the “Best People and Ideas of 2011” and in 2014 he received the prestigious “Outstanding Artist Award” at the Nebraska Governor’s Arts Awards. Still’s Symphony No. 3 is scored for piccolo, two flutes, two oboes, English horn, two clarinets, bass clarinet, two bassoons, four horns, three trumpets, three trombones, tuba, timpani, percussion, harp, celesta and strings. The performance time is 25 minutes. The Grant Park Orchestra first performed this Symphony on July 7, 1994, with Kay George Roberts conducting. William Grant Still, whom Nicolas Slonimsky in his authoritative Baker’s Biographical Dictionary of Musicians called “The Dean of Afro-American Composers,” was born in Woodville, Mississippi on May 11, 1895. His father, the town bandmaster and a music teacher at Alabama A&M, died when the boy was an infant, and the family moved to Little Rock, Arkansas, where his mother, a graduate of Atlanta University, taught high school. In Little Rock, she married an opera buff and he introduced young William to the great voices of the day on records and encouraged his interest in playing the violin. At the age of 16, Still matriculated as a medical student at Wilberforce University in Ohio, but he soon switched to music. He taught himself to play the reed instruments and left school to perform in dance bands in the Columbus area and work for a brief period as an arranger for the great blues writer W.C. Handy. He returned to Wilberforce, graduated in 1915, married later that year, and then resumed playing in dance and theater orchestras. In 1917, Still entered Oberlin College, but he interrupted his studies the following year to serve in the Navy during World War I, first as a mess attendant and later as a violinist in officers’ clubs. He went back to Oberlin after his service duty and stayed there until 1921, when he moved to New York to join the orchestra of the Noble Sissle–Eubie Blake revue Shuffle Along as an oboist. While on tour in Boston with the show, Still studied with George Chadwick, then President of the New England Conservatory, who was so impressed with his talent that he provided his lessons free of charge. Back in New York, Still studied with Edgard Varèse and ran the Black Swan Recording Company for a period in the mid-1920s. He tried composing in Varèse’s modernistic idiom, but soon abandoned that dissonant style in favor of a more traditional manner. Still’s work was recognized as early as 1928, when he received the Harmon Award for the most significant contribution to black culture in America. His Afro-American Symphony of 1930 was premiered by Howard Hanson and the Rochester Philharmonic (the first such work by a black composer played by a leading American orchestra) and heard thereafter in performances in Europe and South America. Unable to make a living from his concert compositions, however, Still worked as an arranger and orchestrator of music for radio, for Broadway shows, and for Paul Whiteman, Artie Shaw and other popular bandleaders. A 1934 Guggenheim Fellowship allowed him to cut back on his commercial activities and write his first opera, Blue Steel, which incorporated jazz and spirituals. He continued to compose large-scale orchestral, instrumental and vocal works in his distinctive idiom during the following years, and after moving to Los Angeles in 1934, he supplemented that activity by arranging music for films (including Frank Capra’s 1937 Lost Horizon) and later for television (Perry Mason, Gunsmoke). Still continued to hold an important place in American music until his death in Los Angeles in 1978. The Awakening begins with a stern unison proclamation which is followed by a playful main theme, given in bright orchestral sonorities with much dialogue between strings and winds. A contrasting folk-like melody, built from a gapped scale, occupies the center section. The main theme returns to round out the movement’s form. Prayer is based on a haunting lament for the English horn. A broad, hymnal theme is introduced by the strings and becomes more agitated as the music unfolds. An altered recapitulation of the lament theme, led by English horn doubled by piccolo, closes the movement. Relaxation is a lighthearted dance featuring the high piping woodwinds. The finale, Day’s End and a New Beginning, is more ominous and heavy in character than its title might imply. The main part of the movement is based on a spiritual-inspired string theme, and grows with a steady tread to a full but foreboding ending.